New Mexico Hatch chile peppers are a popular spicy pepper with a depth of flavor that allows it to be used to create delicious breakfast, lunch, and dinner recipes. Learn how Hatch chiles have become one of the most popular chile peppers in America. 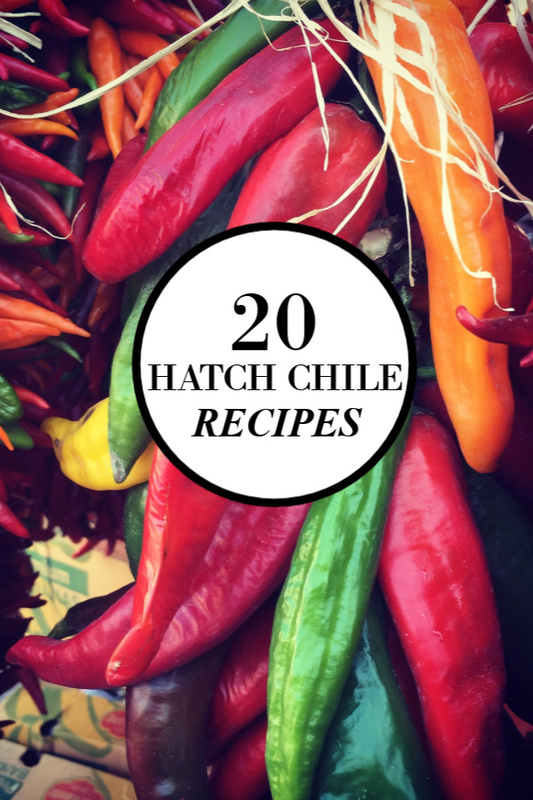 Then make some of your favorite Mexican foods using delicious Hatch chile recipes below! Including the crazy popular Hatch Green Chili with Pork. What is a Hatch Chili Pepper? 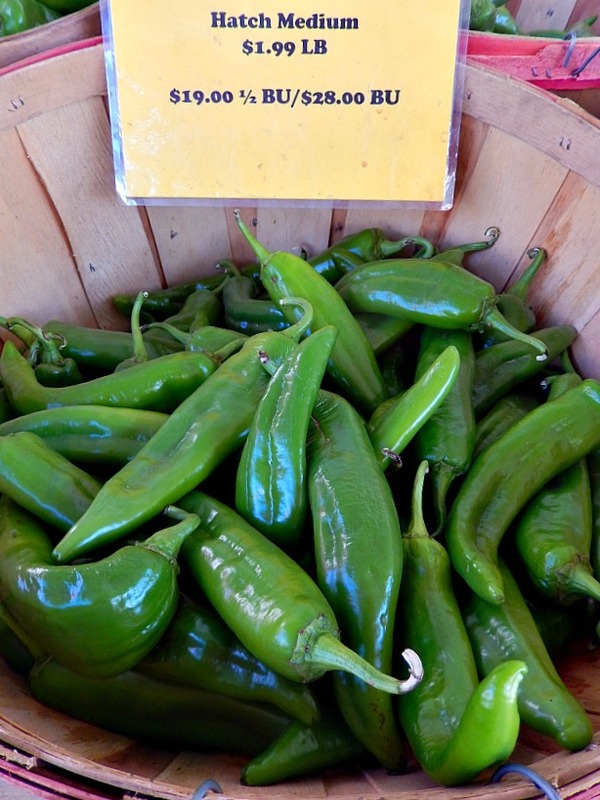 There are several New Mexico chile varieties, but the Hatch chile peppers are highly coveted. 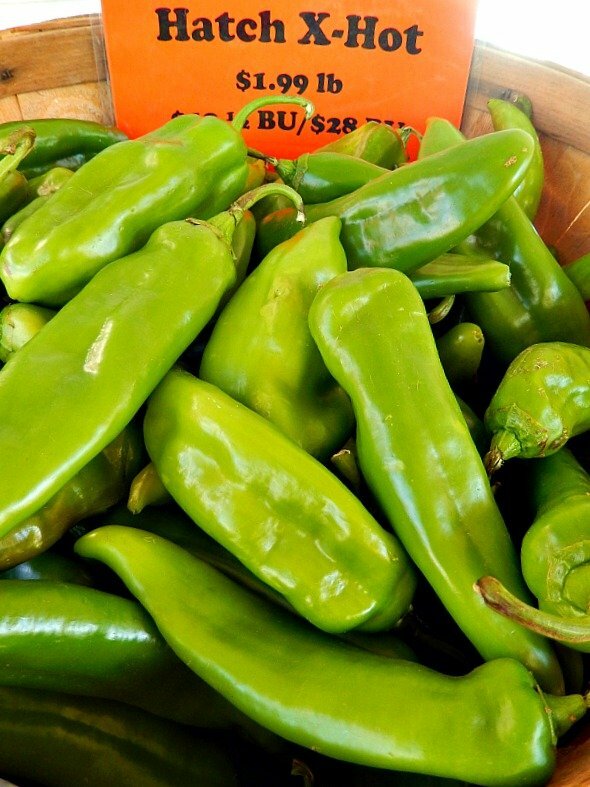 Simply stated, the Hatch Chile is grown in the Hatch Valley in Southern New Mexico. The town of Hatch, New Mexico (population 1,600) and the Hatch Valley region are home to some of the most coveted chile peppers on the market. Known as Hatch peppers, these chiles are more than a single type. In fact, there’s a wide selection of sub-varieties grown in the Hatch Valley, that fall under the title of “Hatch chiles” which gives Hatch peppers a wide swing on the Scoville scale. If you have ever lived in or visited New Mexico, you likely know that New Mexico chile peppers are part of the rich culture and heritage that the state is famous for. In 1999, the New Mexico legislature adopted an official state question; “red vs. green chile”. If you have dined in a traditional New Mexico restaurant, you have likely been asked which type of chile pepper you prefer, a red or green chile. The debate over red vs. green chilies will likely last for generations to come. Hatch New Mexico chilies vary in their level of heat, but the spiciness of Hatch green chili varieties is often compared to Anaheim chilies. They have a great balance of smoky and sweet flavors. The versatility of Hatch chilies to be used in Mexican food recipes is amazing! You can use them to create everything from Hatch chile dip and Hatch green chile sauce to breakfast, lunch and dinner recipes. We’ve even heard of people who add Hatch green chile peppers to Mexican dessert recipes like Hatch chile apple pie! Using the Hatch New Mexico chile peppers in these easy breakfast recipes gives them a little extra kick to get you going in the morning! Links to the recipes are shown beneath the photos. Overnight Hatch Chile Breakfast Burritos – These Southwest breakfast burritos are smothered with red Hatch chili sauce to keep the heat down. Feel free to toss in a few green chilies if you want to spice things up a bit more. 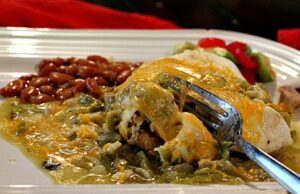 Hatch Green Chili Smothered Breakfast Burrito – This easy breakfast burrito recipe is one of our favorites! 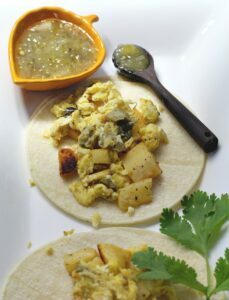 Easy Breakfast Tacos with Hatch Chiles, Potatoes, and Eggs – These breakfast tacos are fresh in flavor and a great way to enjoy Mexican food for breakfast. 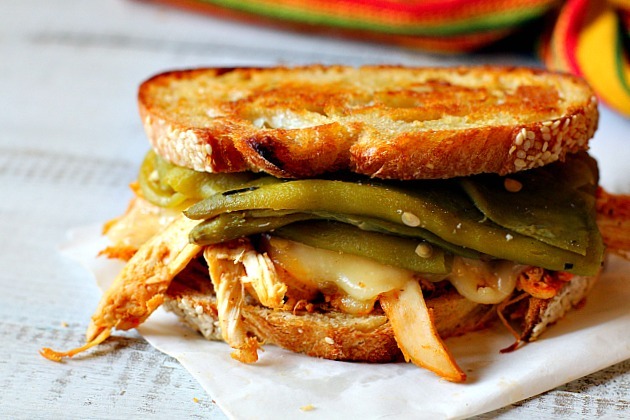 And one more Hatch chile recipe to add to your lineup. Hatchamole Scrambled Egg Breakfast Sandwich – This scrambled egg breakfast sandwich has thick slices of rustic white bread topped with Hatchamole, scrambled eggs, and your favorite Mexican food toppings. A beautiful Southwestern scrambled egg breakfast sandwich to start your day. Eggs Rio Grande Mexican Breakfast – This New Mexican breakfast idea has a line-up of ingredients that will wow the palate. An easy Southwestern scrambled egg recipe to feed your next hungry breakfast or brunch crowd. Hatch Chile Bacon Quiche – A great way to showcase the Hatch green chili peppers, and a wonderful Southwestern breakfast or brunch recipe. Chicken recipes with Hatch chiles are the most popular, probably because smoky chilies pair so well with the blank canvas of chicken breasts! Tomato Cream Mexican Chicken Casserole – Layers of corn tortilla chips, chicken and cheese, all drenched in a luscious tomato cream sauce spiked with Hatch chile peppers. Instant Pot Creamy Chicken Tortilla Soup – A hearty, tomato based chicken soup with spicy Hatch green chili peppers. 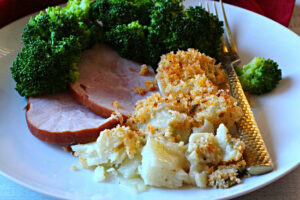 A delicious quick easy dinner recipe. 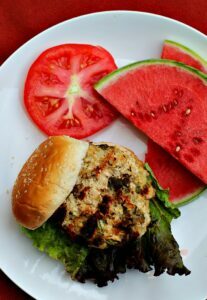 Hatch Green Chile Chicken Burgers – Looking to switch up your burger game? This healthier burger is oozing with green chiles and Southwestern flair. 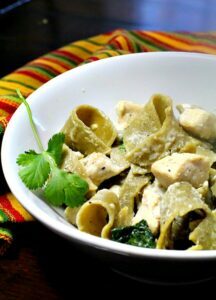 Hatch Green Chili Pasta with Chicken and Spinach – This Southwestern recipe, Hatch Green Chili Pasta, is fabulous mixed with a spicy cream sauce, chicken breast, and spinach. When game day rolls around and you’re looking for a spicy party appetizer, make one of these delicious Hatch chile appetizers. They’ll be the hit of the party! Hatch Green Chile Hummus Dip – Hummus comes alive when paired with Southwestern ingredients. A kick of heat from roasted chopped Hatch green chili peppers and a shake or two of cumin and Tabasco Sauce. 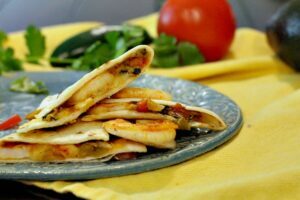 Green Chile Shrimp Quesadillas – A Shrimp Appetizer with a Southwestern Touch. These Green Chile Shrimp Quesadillas are seasoned with New Mexico Red Chile Powder, mixed with Hatch Green Chile and folded into a cheesy flour tortilla. 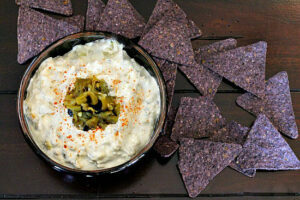 Hatch Green Chile Dip – A creamy dip with Greek yogurt, mayonnaise and cream cheese. Spicy with Chimayo chile powder and Hatch green chili peppers. Hatch Green Chile Colorado Style – What makes this Colorado green chili recipe different are the Hatch green chili peppers, a pork shoulder roast, and a lineup of unique spices. 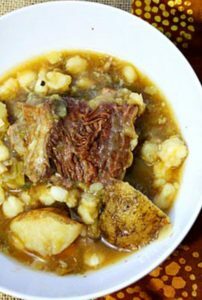 Hatch Chili Short Rib Stew – A simple stew of braised short ribs, chewy white hominy and chunks of potato. Perfect for a Winter night’s meal. 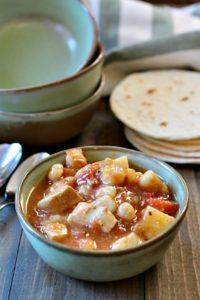 Pork Green Chile Stew, Chile Verde – A hearty stew brimming with Chile Peppers, cubed pork loin roast, bite sized pieces of chicken breast, potatoes and hominy. Anthony Bourdain’s Beef Chili Recipe – This is Anthony Bourdain’s Beef Chili Recipe, New Mexico Style. Deep and richly flavored, this is a hearty chili stew featuring beef chuck and New Mexico Hatch chile and poblano peppers. 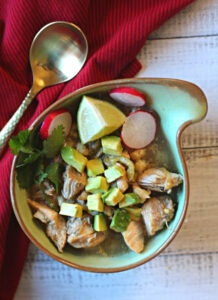 Instant Pot Pork Posole with Hatch Chile – The chiles and seasonings infuse great flavor into the pork when cooked under pressure. 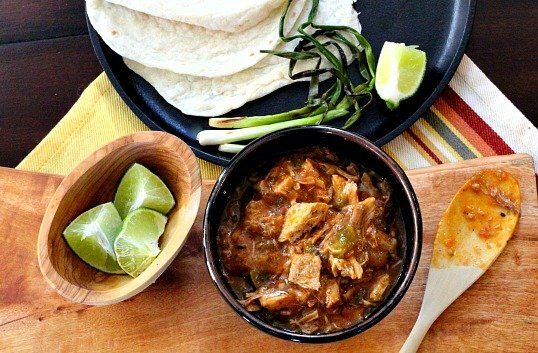 Pork posole can be complicated, but the pressure cooker turns this into a one-pot breeze. Whether you want a spicy stew, some Hatch chile chili, or some New Mexico chile quesadillas, we’ve got you covered! These tasty comfort food dinner recipes are easy to make and are hearty enough to please the biggest of eaters. 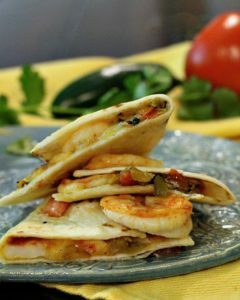 Green Chile Shrimp Quesadillas – These Green Chile Shrimp Quesadillas are seasoned with New Mexico Red Chile Powder, mixed with Hatch Green Chiles and folded into a cheesy flour tortilla. 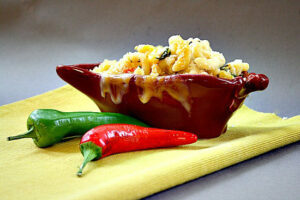 Hatch Green Chile Macaroni and Cheese – Your favorite comfort food just got a kick of Hatch green chili goodness! 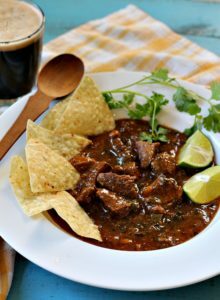 Bourbon Beef and Bean Chili – The smoky taste of this chili is perfect for a cold winter night meal or to feed a crowd on game day. Hatch Green Chili Burgers – A third pound of grass fed beef mixed with a kick of Hatch green chili peppers and tequila lime seasoning, these hearty, thick hamburgers are guaranteed to fill you up. Instant Pot Scalloped Potatoes with Hatch Chile Peppers. Classic scalloped potatoes get a kick of heat from roasted Hatch Chile peppers and a much quicker cook time thanks to the Instant Pot. This scalloped potato au gratin should be put on your “must make” list, and soon. Of course I own a good supply of Hatch Chile Powder. Chile peppers are dried and then ground into a find powder to use in sauces, soups, and chili. And to season tacos, enchiladas and burritos. It’s flat out delicious. But hands down, my favorite New Mexico chile powder is Chimayo Chile Powder. With an exquisite copper red color and a bold flavor that can’t be beat, it’s my first choice for cooking any Southwestern recipe. Be cautious of purchasing packages of chile powder labeled Chimayo Chile Powder. 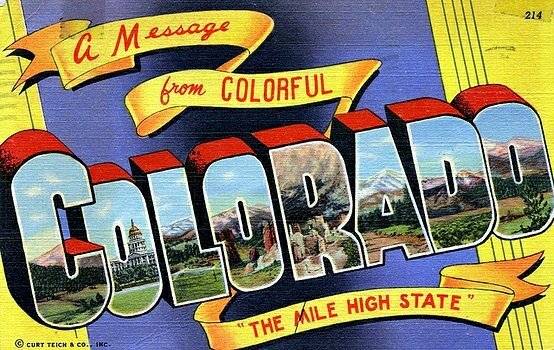 It only comes from Chimayo, New Mexico and comes with a pretty price tag. I’ve seen bags of chile powder labeled Chimayo that are selling for $3.00. I doubt this is authentic. Bags sold in Chimayo sell for $15 – $20. I purchase my Chimayo chile powder in the village of Chimayo and trust the purchases from the Trading Post next to El Santuatio de Chimayo. I’ve also feel comfortable with my purchases from Ortega Weaving in Chimayo. Chimayo Chile comes from a less common strain of pepper, called Capsicum annuum Chimayo. This distinctive smaller Chile has been adapted to live in the high and dry arid climate of northern New Mexico. The chile is grown in small batches from original heirloom seeds passed down from generation to generation. The local families in Chimayo have been farming this strain of chile for over four hundred years. Chimayo Red Chile powder is wonderful in any Southwestern dish as it maintains its heat without being overwhelming. It’s excellent in soups, chili, stews, and sauces. The Pueblo chile pepper is known as mirasol — “facing the sun” — and is different from others since it grows reaching for the sun, rather than hanging down. And compared to New Mexico Hatch Chile, a Pueblo Chile is bigger, meatier and hotter. And I’m here to say has a more notable chile flavor.